April 12th at the 30th Annual Governor’s Arts Awards, Free Arts of Arizona won the award for Community. Mark Feldman accepted the award in front of a packed house at the Herberger Theater Center. In attendance were many elected officials from the State of Arizona as well as leaders in both the arts and business communities. Since 1982, 138 distinguished Arizona artists, arts organizations, businesses, educators and individuals have been recognized for their passion, creativity and devotion to the excellence and diversity of Arizona’s arts and cultural community. The Governor’s Arts Awards are presented in six categories: Artist, Individual, Arts in Education Organization, Arts in Education Individual, Business and Community. Our award is a Jeff Reich original entitled Pathways. 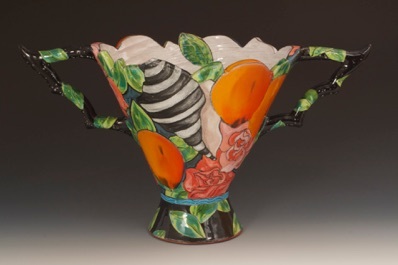 It is a stoneware pottery vessel and it is on display in our offices. Free Arts joins past Community honorees such as: The Drawing Studio of Tucson, Valley Youth Theatre, Chandler Center for the Arts, Childsplay, Inc., and Sedona Jazz on the Rocks to name a few. This award is a testament to our Founder Margaret Beresford, our founding executive director, Stephanie Small, all our current and former employees, the extremely hard work of over thousands of dedicated and passionate volunteers, our committed members of the Board of Directors and all the arts and culture organizations who have supported us over the years. We dedicate this award to the almost 60,000 children and youth we have served since our inception in 1993. Other Arizona artists who made Governor’s Arts Awards for this year’s event were Sherrie Zeitlin, Patricia Sannit, Halldor Hjalmarson, Kevin matthew Stevens, Cristina Cardenas, Yolanda hart Stevens, and Heath Krieger. For more information and a complete list of the award winners click on http://www.governorsartsawards.org/ . Jeff Reich was selected to be a 2011 Awards Panel Member for this year’s 2011 Arizona Annual Governor’s Arts Awards, which are presented by The Arizona Citizens for the Arts, The Arizona Commission on the Arts, and the Office of the Governor. 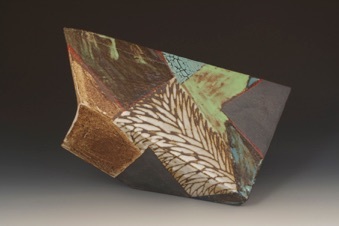 In addition to his juror activities, one of Jeff’s pieces (Pathways, pictured to the left) was selected to be an award presented to a Governor’s Arts Awards recipient. 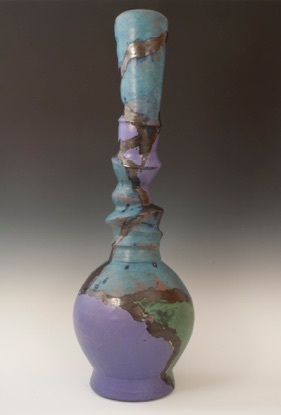 The recipient of Jeff’s piece was Free Arts of Arizona, a nonprofit organization that brings the healing powers of the creative arts to abused, neglected and homeless children by partnering with over 100 group homes, treatment centers and shelters in Maricopa County. Anderson Ranch is a learning community dedicated to creativity and growth through the making and understanding of the visual arts located on five scenic acres in Snowmass Village, near Aspen, Colorado. 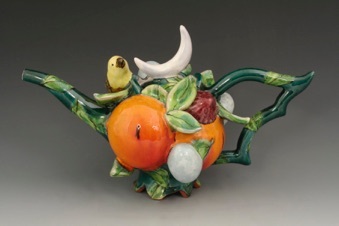 It promotes personal and professional development of artists of all levels of expertise through year-round workshops in ceramics, sculpture, photography, new media, painting and drawing, printmaking, woodworking, furniture design and more. Their artists residencies for emerging and established artists, summer internships, visiting artists and critics, community outreach, and public events offer a full spectrum of opportunities to creative people of all levels. The facilities feature fully-equipped art studios and galleries. Anderson Ranch programs and activities including art auctions and artist slide lectures, attract thousands of artists, art-lovers, students, faculty and patrons annually to this historic Rocky Mountain ranch dedicated to the fine art. 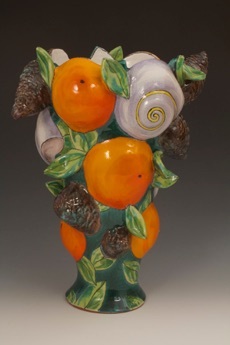 To learn more about this beautiful art center visit http://www.andersonranch.org/ . Yellow is the color of spring here in the Sonoran desert! 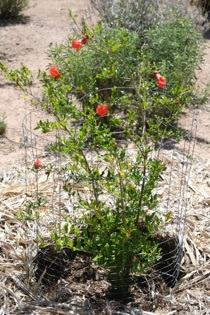 This is one of our Desert Museum Hybrid palo verde trees, developed by the Sonoran Desert Museum in Tucson, Arizona. It’s thornless! Our Agave weberi is starting to bloom! 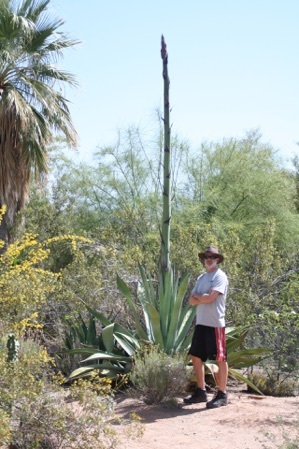 This large agave is sending up its flowerstalk, which will reach between 25 to 30 feet when it finally flowers. Right now it is approaching 15 feet, so it’s just getting going! For the most part, agaves are monocarpic (once-blooming), so this plant will die after the bloom is over. Howver, there are plenty of young agave offsets (“pups”) at its base that we are transplanting all over the property. 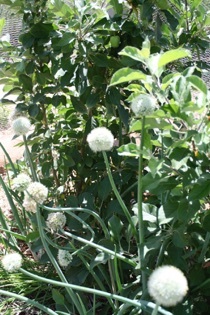 The bloom itself will produce vegetative offspring called bulbils, rather than seeds. This will be a show for weeks to come! 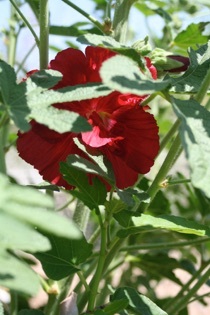 Late spring is a wonderful time in the vegetable garden. We’re saying a fond goodbye to the tasty winter greens that are starting to bolt, but it is a joy watching the young warm weather vegetables & fruits take off with the longer days and warmer soil. 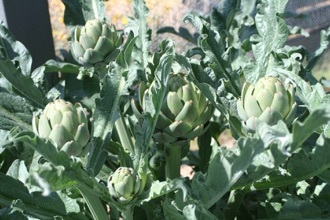 Now it will be a race for them to grow and produce before the killing heat of summer sets in (June), with temperatures between 100 and 115 degrees under cloudless skies every day. 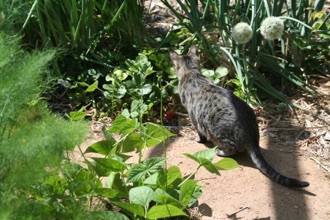 Photos above, clockwise from top: artichokes; Maurice the ocicat peering into the strawberries; deep red hollyhock; onion flower balls; flowering young pomegranate tree.